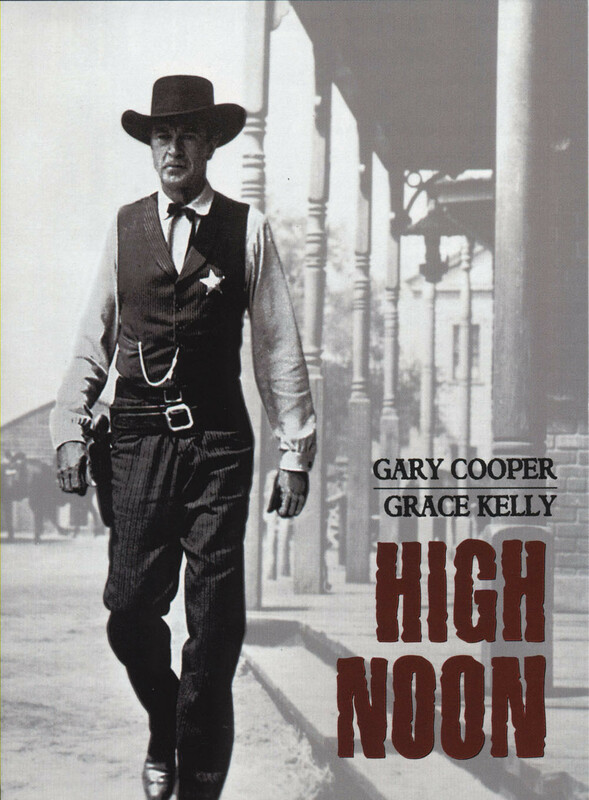 When Top Ten Western lists are made, 1952's High Noon usually makes the cut. In the AFI Best Film list it came in at #27. The film was chosen for preservation the first year of the National Film Registry’s existence. Those who remember this classic Western are likely to remember the climatic shoot out at the conclusion of the film. But do they remember the dramatic church congregational meeting just before that shoot out? We certainly do here at Movie Churches. Gary Cooper won an Oscar playing Sheriff Will Kane on his wedding day. On that day he learns that a man he put away for murder is returning on the noon train to extract revenge. For most of the film we see Kane going around his small Western town seeking help to fight Frank Miller and his three brothers. Help is slow in coming. Even his new wife, Amy (played by Grace Kelly), tells Will she'll be leaving town. She uses her Quaker faith as the reason. She became a Quaker when her father and brother were killed while fighting for a just cause. When her new husband is facing a tough fight, she decides to take the train out of town before things get bad, so it doesn't seem that Amy came to her faith through intense Biblical study and prayerful meditation, but rather through a desire to avoid pain. Bad news for Amy: as pacifists through the centuries have learned, those who refrain from violence aren't exempt from the dangers of living in a violent world (exhibit A being the Cross). Will goes to a bar to ask for help and is laughed out of the place as it is pointed out to him that many in the bar are friends of Frank Miller, the man gunning for Will. An amazing number of men can be found in the local saloon on Sunday morning (you would think more of them would be sleeping off Saturday night). Finally, Will does go to the church for help. 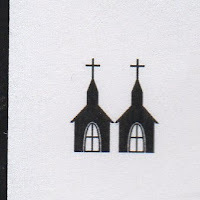 The church is a lovely building, white with a tall steeple and a hitching post in front for horses (some attached to carriages). The congregation sings “Battle Hymn of the Republic,” which doesn’t seem to be a hymn of pacifists. The minister, Dr. Mahin, reads a fiery passage from Malachi 4. Dr. Mahin is initially wary, but then asks Kane to have his say. Kane points out that years ago many men in the room helped him face the outlaws. Now that those outlaws have returned, he is asking for their help again. The men in the church immediately begin to snipe at each other, taking different sides of the argument. One man stands up and says they’re arguing like children, and they should speak like adults. He points out that children are still in the room, and they should be sent out. The children cheer as they storm out the door. I think it’s worth taking a moment to consider the state of church child care in the Old West. It seems nonexistent. Now during a worship service, this is somewhat understandable, as the parents and clergy want children to be a part of worship. Sadly, the cheers of the children upon their exit show that they were not thrilled to be there. But when the meeting changes into a business meeting; childcare should really be provided, rather than allowing the children to run amuck outside with their games of rope-less tug-o-war. Some in the congregation argue for helping Kane and some argue against it. They all seem anxious to blame “those politicians up north” for not taking care of the lawlessness. But they seem more willing to argue than take action. The film captures this aspect of most church business meetings quite accurately. The minister is asked for his thoughts, and he gives this little speech, “The commandments say, ‘Thou shalt not kill,’ but we hire men to go out and do it for us. The right and wrong seem pretty clear here. But if you're asking me to ask my people to go out and kill or get themselves killed, I can't do it.” To my ears, there is more than a tinge of cowardice in that speech. If he is a pacifist, he should boldly state the position. But if he is not, he should call for courage from his congregation. So Will leaves the church without help. His only help (SPOILER ALERT) eventually comes from his Quaker wife, who shoots a bad man in the back as he's reloading his gun. Though one would hope a church would find a way to be helpful to a good man like Will Kane in his hour of need, this church does not. 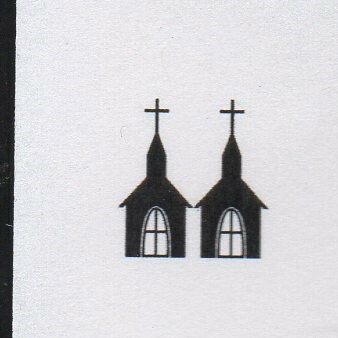 So the best we can give it is Two Steeples.